The Water Damage Restoration process begins when you call us. Scope Environmental is available 24/7 for water damage emergencies. When dealing with water damage time is not on your side, even a delay of a couple hours can significantly increase the severity of the damage. Water damage can be chaotic, when you call Scope Environmental we understand the situation and what you must be going through. Feelings of anger, confusion, stress and vulnerability are completely normal during a crisis like this. Scope Environmental has the specific, certified, water damage training and experience to help you through this difficult time. We specialize in water damage restoration, in fact it is the bedrock of our business. Speed is crucial when dealing with water damage. No two Water Damage Cleanup Restoration situations are the same, the longer water damage is left to sit and not properly handled, the more damage it is likely to do. Scope Environmental responds quickly to your emergency and use the most advanced technology available to handle every facet of your emergency from the initial inspection using thermal imaging technology to cleanup and finally the full restoration. Typically the water damage cleanup and restoration process follow five steps. Clean and sanitize the damaged area. 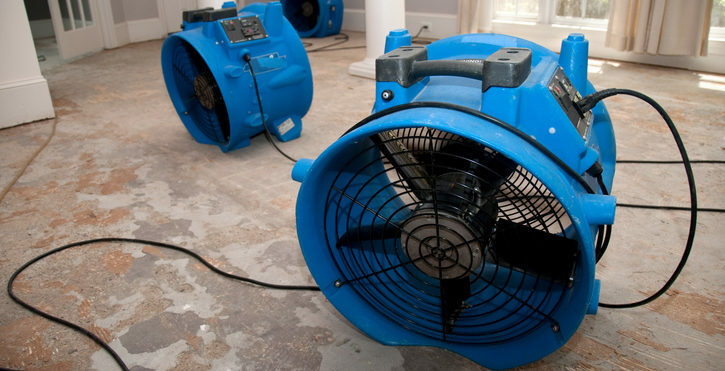 The restoration companies involved in such efforts will use a number of tools such as blowers, floor driers and fans, to ensure they remove the excess water first then the use dehumidifiers, air scrubbers, and heaters are brought in to remove any airborne allergens and minimize the potential growth of mold or rot. They may need to do some serious mold treatments of the areas affected by the flooding. It will make a significant difference on your restoration including the cost and end result when choosingn a certified and experienced company that understands how to properly deal with a water damage loss situation in your property. If life happens and you find yourself needing a company the specializes in Water Damage Restoration, Scope Environmental is the only call you need to make. We will take care of the water damage, work you’re your insurance, handle all the billing and restore your property to better then pre-loss condition. Restoring water-damaged homes after a disaster can be a real challenge if you don’t know what you’re doing. Depending on the source of the water you can experience light to heavy stains to the walls and the floors of your home. Flooding can be caused by a number of problems such as broken pipes, rain/wind, tree damage, leaking plumbing fixtures, and natural disasters, causing different levels of destruction throughout your home. Once water floods the house you can check whether the restoration efforts are going the right way in a few ways. If you still sense a musty, stale smell in the air this means you may have rotting wood and water still remaining somewhere around the home. You could also notice a change in the color and texture of the walls and floors and in some cases that will be irreversible and may need serious repair work. This won’t just affect the looks of your home but also its value and potentially your health. Scope Environmental is a professional water damage restoration firm and is certified by the IICRC in WRT, MRT, AMR. Customer Satisfaction is our # 1 mandate, call Scope Environmental and experience the Scope difference.